Well, frankly, we all know the answer to this one. And yet, there is still something weirdly satisfying about witnessing a high-end device undergo creative carnage and destruction. This is undoubtedly why stress test videos have really been getting absurd recently. 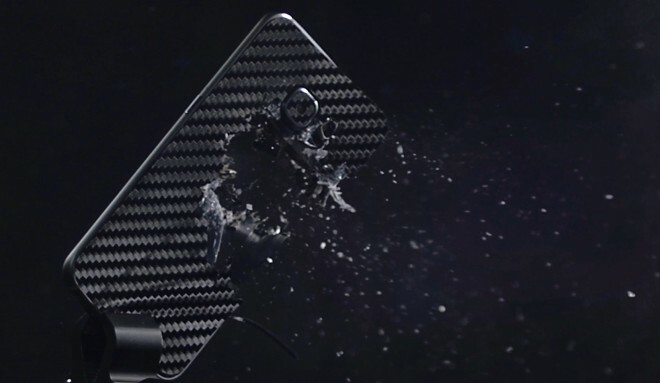 Needless to say a slick curved phone with a glass finish has practically no chance of surviving even most air gun shots. Still, the guys over at dbrand really didn’t want to leave anything to chance and opted for a .50 AE Desert Eagle. Both are legendary for being extremely high-powered and, but the S6 was simply blown away (apologies for the bad pun there). Dbrand is actually in the business of selling customized skins for smartphones and tablets, which explains why the Galaxy was fitted with an extra layer, before abruptly losing a large chunk of its body. One could argue that the message is kind of contra-intuitive, seeing how one would normally expect some added protection from a skin or case, but, who cares, we get to enjoy the millions of fine pieces of silicon, glass and countless hours of design and manufacturing go up into a mesmerizing cloud of high-res slo-mo destruction. Speaking of which, the video itself is also a testament to the Phantom Flex4K camera it was shot with. The level of detail captured in ultra-slow motion at 4K is astounding and definitely deserves recognition. We also find another familiar face associated with the clip – Lewis Hilsenteger from Unbox Therapy. You might remember him as the guy who kind of started the whole bend trend with the iPhone 6, so we can only assume he was there to supervise the carnage levels, as well as promote his YouTube channel.